It is all well and good that a debate is established about the need for High Speed rail services. It is another thing to look at the inherint problems and decide where to establish such lines, or where they should end up. The Heathrow debate is hotting up with the latest offering from Greengauge 21"The Heathrow Opportunity"(12/2/10). In the previous blog (Fast Trax - 13/2/10) we mentioned briefly the need to look at rational alternatives. Greengauge 21 has not done that and is becoming imprisoned by its own proposals. It is a case of an original proposal being accepted as gospel and thereafter self perpetuating. Basically they say that Heathrow should be a rail hub with connections all over the country. Building a new hub at West Drayton is just a waste of money and a unnecessary blight for the people who live in that area. 1-Our initial proposal was that a high speed line should be built from Reading through Heathrow to Gatwick Airport and on to Ashford to provide the connection with the Channel Tunnel. - We shall call this the Southern high speed line (SHSL). - This would provide an important connection to an existing major hub at Reading (already being updated and extended), providing the possibility of connections or extensions of services further north, west and even south. In the central section the all important overdue and needed high speed connection between Heathrow and Gatwick would enable the two airports to be interdependent. At Ashford the connection to the Chunnel opens up the possibility of direct services to near mainland Europe from both airports and beyond while avoiding the bottleneck of London. Also with the SOUTHEASTERN "Javelin" services to St.Pancras it has been shown that the North/North East Kent towns achieve better and more rapid connections to the capital. The same improvement in connections could be achieved along this SHSL. The fast track line would run Reading- Heathrow T5- Heathrow Central- Heathrow T4- Gatwick- Ashford- Channel Tunnel.Take note that the part of the line Heathrow T5-Central-T4 would need no new construction because the tunnels already exist so no disruption would be implied for the airport unless a turn were needed at the Central area to connect with the line south to T4. 2-In the electrification scheme for the GWML (Great Western) the route to Oxford from the GWML is to be electrified. It would be not very much more expensive to extend this scheme northwards to connect to the new high speed line from London to Birmingham(Chiltern high speed line - CHSL) where the two lines could intersect somewhere to the south of Banbury. This way passenger services can be provided from Birmingham to Heathrow at a lower cost than the deviatory idea from Euston (Greengauge 21´s idea is figure 3.2 illustrated on page 15 of their document). Of no less importance but perhaps greater is the linking of the electrified lines CHSL and WCML to the Channel Tunnel (through the Reading to Ashford high speed line)without going through the bottleneck of London and thus offering the possibility of freight trains direct though the Chunnel. 3-The main direction of the electrification of the GWML is to Bristol and South Wales. However, the updating is to stop at Cardiff or even Swansea. The first consideration is that the original Great West Line was built(in the 1800s) to such a standard that without substantial track straightening higher speeds than those actually used are possible. Therefore, why not go the whole way and update the line to high speed. Another consideration is that the line Cardiff to Swansea is only two track while high speed lines should be four track, at least in this case in the most used corridor up to Swansea. Stopping this update at Cardiff or Swansea does not take into consideration the potential benefits of any extension to the west and especially the ports. 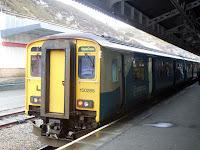 Is it not better, therefore to continue on to Fishguard at least? Of course this would benefit local services in South West Wales but that is not the only consideration. Fishguard is a major ferry port for services to/from Ireland. If Eurotunnel were given the go-ahead then that company could offer services for cars and lorries direct from Fishguard through Reading and along the SHSL to Calais (or even onward to Lille). That would take the through Irish traffic off British roads directly on to mainland Europe. No traffic fumes would be emitted on the British part of the journey. The volume of demand would have to be looked at in detail but the potential is tremendous. 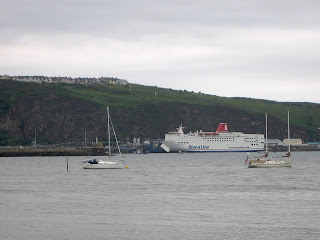 At present Stena Line offers 3 services per day Rosslare-Fishguard. Moreover, Stena Line offers 4 services weekly Cork-Swansea where a number of vehicles also travel through Britain on to mainland Europe (either through the Chunnel or through other ports such as Harwich). Without doubt what would be of greater interest and a direct target for through Eurotunnel services are the ferries from Ireland to France (from Cork 1 weekly while from Rosslare 8 weekly to Roscoff and Cherbourg). What also has to be mentioned is the probable additional effect on the ferries Rosslare-Pembroke(2 services per day)and the possible knock-on effect on ferry services Dublin/Dun Laoghaire - Holyhead. It can be seen, then, that such direct Eurotunnel (or any other company) services along the GWML and SHSL would reduce the volume of traffic on British roads and the toxic gasses in the air. 4-To extend this idea further Eurotunnel services could also be offered from a site near Bristol(Almondsbury) where the M4 and M5 motorways cross. This would provide services for traffic from the rest of South Wales,Bristol and South West England and even eastwards to Swindon. Also another site for Eurotunnel services to Europe could be offered from the West Midlands either in the region of Bristol International airport or Wolverhampton, where the M6 and M54 motorways connect. That way as well as serving the local conurbation, traffic from the north and/or East Midlands would also be taken off the roads when going to Europe. Thus the crowded South East England bottleneck would be aleviated. These services from the West Midlands would travel south to Reading and then along the SHSL to the Chunnel. In these ways it can be seen the potential for taking off the roads of Britain tremendous volumes of cars and heavy traffic with all that implies in cleaner air and less crowded roads.This would be most notable effect in the crowded South East bottleneck. But that is the endgame - is it not? The time taken for journeys from Fishguard to Lille would be under 6 hours, from Bristol to Lille under four hours and from the West Midlands to Lille (though Reading) under 5 hours. These times are conservative estimates based on present rail timetables on non(as yet) upgraded lines. Therefore, with implementation of the SHSL, in addition to the other line upgrades, the time saving could be substantially greater. The faster the times, the more attractive the service becomes. Reading - Maidenhead- HeathrowT5- Heathrow Central- Heathrow T4- Feltham- Esher- Dorking- Gatwick- Tonbridge- Ashford- North East Kent. (A direct line from Feltham to Esher and Dorking might not be the best route and could suffer modification - the rest of the line is the most direct and potentially beneficial). These would replace Heathrow - Gatwick coaches (up to 6 per hour) also Railair coaches to Reading (3 per hour), Woking (2 per hour) and Feltham (10 buses per hour) That means a lot of heavy vehicles occupying road space with each belching out diesel fumes. The gain, even in the Heathrow area alone, would be enormous. 6- The implications for Airtrack: Airtrack will have to be re-looked at. This is important anyway as there are objections to the services - especially on the Bracknell line to Reading. Most of the objections refer to the extra rail traffic on the line causing more and longer level crossing closures. However, that is only part of the case. Obviously,then, the benefits of Airtrack are not as great as they are being sold. Since only 2 stops are proposed to Reading - at Bracknell and Wokingham - with SHSL from Reading to Heathrow the need for this Aitrack service is called into doubt. As we can see the service on the SHSL would be faster with only 1intermediate stop at Maidenhead. Moreover, the service would be better because the service would stop at T5 - T1,2,3 -T4 on its way to Gatwick and Ashford. A subsequent Airtrack service could have a stopping pattern Heathrow T5- Heathrow Central- Heathrow T4- Feltham- Twickenham- Richmond- Clapham Junction- Waterloo (maybe even starting at Reading with an intermediate stop at Maidenhead). BAA envisaged only 2 services per hour (mainly due to lack of train paths) but we are sure that the resulting demand from the stopping places south of the Thames, particularly at Clapham Junct. and Waterloo, could well rival the Heathrow Express service from Paddington. The case for the Airtrack service to Guildford is also called into question. If there were a regional stopping service on the SHSL stopping at Feltham, Esher and Dorking then the case for Guildford fails. We are then left only with the proposal for HE trains to run from T5 to Staines. This only benefits the BAA owned HE and Airtrack systems. The connection from T5 to Staines (with the disruption of the new chord at Staines) would be unnecessary. BAA could be compensated with the aforesaid extra services to Waterloo. Also what can be looked at is the extension of the HE services through Crossrail to connect at Liverpool Street and merge with the Stansted serices of Stansted Express thus becoming the Heathrow-Stansted Express. This would have a knock-on effect of freeing up platforms at both Paddington and Liverpool Street mainline stations for more long distance services. Also passengers along the Crossrail route up to Stansted airport would be better served without having to travel on the Underground to Paddington. Everyone turns out to be a winner. To conclude, the southern alternative, SHSL, must be considered. It would benefit both Greater London and the rest of the country. Rapid rail services attract passengers as we have already seen with the WCML and ECML upgrades. The ill-informed narrow-minded viewpoints of politicians and self serving pressure groups have to be shown to be wrong. Better alternatives do exist.